Ed Ruscha is known for his detached, cool gaze over the American landscape, its vernacular and built environments. He is a leading voice in contemporary art, consistently subverting the aesthetic and conceptual conventions of photography and painting, as well as the mythic narratives surrounding American culture. Ed Ruscha was born in Omaha, Nebraska in 1937 and grew up in Oklahoma City. He moved to Los Angeles in 1956 to attend what is now the California Institute of the Arts. Upon graduating in 1960, Ruscha began working in commercial advertising, putting him in contact with relationships between image and text and the language of consumerism and popular culture. Ruscha’s early drawings and paintings bucked against the prevailing trend of abstract expressionism, depicting wry, irreverent takes on the banality of the urban landscape. In 1962, Ruscha was included in New Painting of Common Objects at the Pasadena Art Museum, a show considered the first museum exhibition of Pop Art that included works by Andy Warhol, Roy Lichtenstein and Wayne Thiebaud. In 1963, the year Ruscha’s now-famous artist book Twentysix Gasoline Stations was published, he received his first solo show at Ferus Gallery in Los Angeles. Ruscha made sixteen artist books in the 1960s and 1970s, most of them comprised of photography taken in an antagonistically plain, documentary style, covering subjects such as swimming pools, parking lots and Every Building on the Sunset Strip (1966). In his photography and painting, Ruscha does not attempt to idealize his subjects, but rather stares deadpan at the ordinary objects and spaces that exist on the periphery of the experience of our surroundings. Ruscha is also celebrated for his approach to language, which is often amusing, incongruous and common, exploring the multiplicity of words and turning them into solid objects to be contemplated and played with. Ruscha’s first major retrospective was in 1982 at the San Francisco Museum of Modern Art. 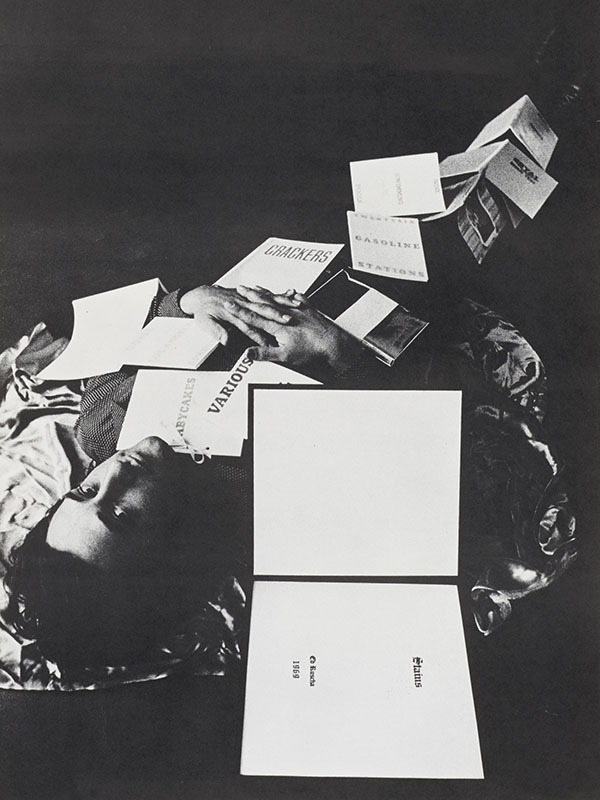 The cover of the catalog featured a drawing he had made in 1979, with the text: “I don’t want no retro spective.” Ruscha continues to reside in his adopted city of Los Angeles, actively creating work that speaks to our rapidly changing contemporary landscape, the way we use language and our conception of the American ethos.